Hunting has always been a favorite sport for those who celebrate might and valor. Are you a hunting enthusiast and have you started your own hunting club? Or do you have your own outlet for hunting gears such as guns, bows, and arrows? Whatever it is, if you are looking to spread the word around for your hunting organization, a fitting hunting logo is a must have. There are various ready-made hunting logos out there for your inspiration. You can also see Pizza Logos. With the two guns pointing strategically to the flying duck, the duck hunting logo makes an apt visual for any duck hunting club or companies selling duck hunting gears. You will have space to include your tagline as well. You have a wide range of deer hunting logos here with deer in all shapes and sizes. The presence of arrow or guns further celebrates the mighty hunting spirit. These logos would be great for your deer hunting clubs, hunting gear sellers and so on. Since the ancient days, bow & arrows have been the most powerful instruments for game hunting and the heritage is still continued in the modern era of guns. If you are looking for a fitting logo art for your bow hunting equipment site, this artsy artwork of a passionate archer would be great for you. If you are looking to add some fun element to your Halloween party poster, this cool Zombie hunt logo would be cool for you. It’s colorful, comic and carries the right amusing spirit for your party. You can also see Car Logos. 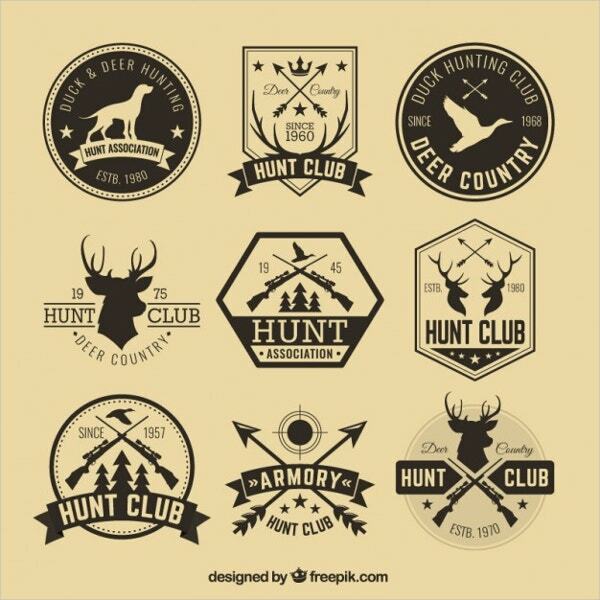 If you are looking for the perfect logo for your newly established hunting club, the logo template set here offers interesting options. Whether you champion the timeless arrow hunting or the modern gun hunting, this logo set would be really fitting. If you are looking for something out of the box for your dove hunting club logo, this geometric bird artwork would be cool for you. You can also use it for your dove hunting gear store. You have a simple yet unique logo design here where you can include a silhouette of the predator you are hunting for, within a circular border. It’s neat & smart. If you are planning a classic retro theme with the logo of your hunting club, this vintage wild hog artwork would be cool, complemented by the big archaic font. The logo will also fit any nature-related organization. You can also see Music Logos. A dedicated fishing enthusiast and a hunter targeting on respective preys make a great logo for your fishing & hunting club. The most interesting part of the logo is surely the bullet focus that borders the entire artwork. With the deer right within the bullet focus, you have an apt logo artwork for your deer hunting club. The logo would also be suitable if you are hosting a deer hunting competition. With the duck forced inside a wedge flanked by a bushy space creates the ideal surrounding for a duck hunting scenario- perfectly complemented the two big hunting guns. Is there any other fitting logo option for your duck hunting club? If you are looking for a suitable logo for your hunting club badge, this classy stag logo artwork would be an awesome thing for you. While the stag marks the prey and arrows below echo the mighty theme of your organization. You have a versatile wolf logo set here which would be great for the wolf hunting organizations, companies that sell hunting gears and businesses which assure premium services as mighty as the jungle wolf. You can also see Airline Logos. The guns crossing the shield and the stars around remind of the prizes won at prestigious hunting competitions. If you are planning a hunting contest, this logo would be grand for your flyers and posters -and also for those into selling guns. With the blazing lion staring fiercely at us, this artwork makes a great choice for those organizations heavily into wild fauna hunting. It would also good for those selling mighty hunting gears for such serious hunting adventures. Hunting logos can take various shapes and forms but in most of them, gun logos are the most common- since guns are the most used weapons for game hunting today. You also have some hunting logos that uphold the mighty spirit of bows and arrows. These logos can be used in your flyers, posters, business cards and so on. You can also see Company Logos.